Bloggers United 8 x OLX Holiday Fiesta + Giveaway!!! We’ve found our perfect match! We’re leveling up this Bloggers United 8! Come join us and find not just our pre-loved clothes but also other items like gadgets and other unique finds! Just like in OLX where you can find unused items that are still functional, in #BU8xOLX, you can also find a lot of other things that we once loved but can now become yours! 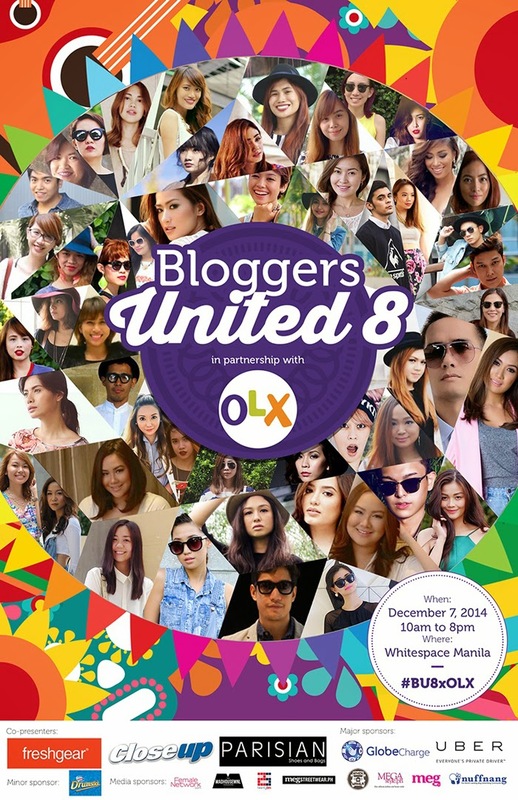 The biggest fashion blogger gathering in the metro, Bloggers United, partners with the #1 online buy and sell platform in the country, OLX.ph, for a grand holiday fiesta this December 7, 10am to 7pm, at Whitespace, Makati! Mark your calendars and expect lots of great finds at affordable price tags from your favorite fashion bloggers! OLX offers a fast and easy way for Filipinos to sell their secondhand items online. It is the Philippines’ largest marketplace for buying and selling items of all kinds, such as clothes, mobile phones, cameras, bicycles, musical instruments, furniture, and cars. It is available on the web at www.olx.ph or on the OLX app on Android and iOS phones. BU just keeps getting better with lots of fun activities, games & prizes and new participating bloggers, so make sure to be there at the best pre-holiday celebration for you, your friends and your family! And since we’re partnering with OLX, expect your favorite bloggers to sell a wider variety of items! #levelup It’s also the season of giving so our charity partner Philippine Red Cross will be there to collect old books and toys. 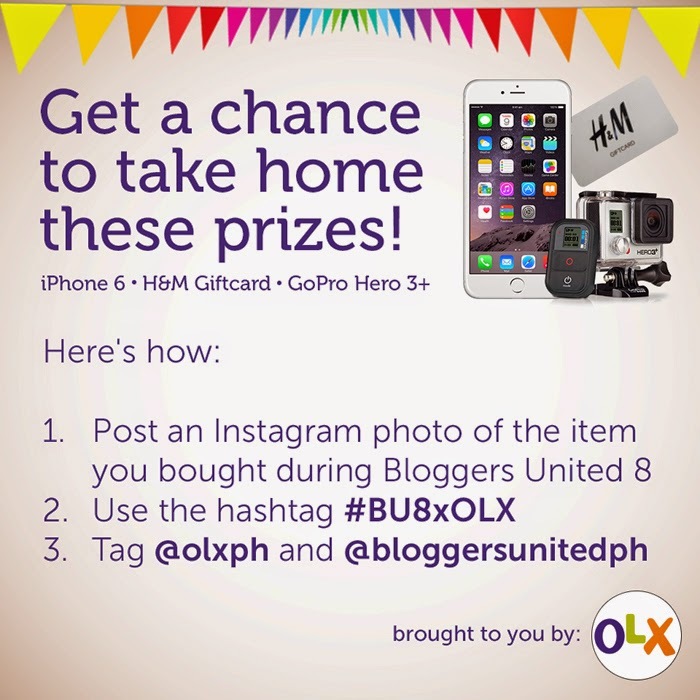 But not only that, you can also win iPhone6, GoPro Hero 3+ and H&M GC’s by attending this event and posting what you bought that day on Instagram with the hashtag #BU8xOLX and tagging @bloggersunitedph and @olxph. So do not dare miss this event! Now, I am giving away 20 passes and will be choosing 10 winners! 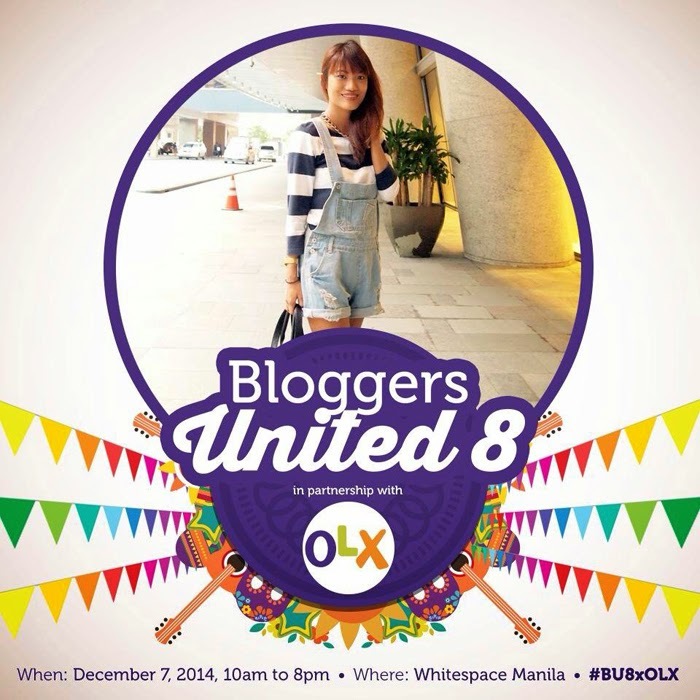 "I want to shop & chika with @paxieness at #BU8xOLX on Dec. 7 at Whitespace, Makati! @olxph @bloggersunitedph (IG) or @bloggers_united (twitter)"
3. Don't forget to tag me! That's it, this is it!!! See you all on Sunday! Come early to get first dibs! Or just come coz you might win big prizes! Sana manalo din ako. Hahaha. Hi! I have posted your banner on my IG @fedhz and Twitter @babyfuzz. Will send the links later. Hard to get the URL on mobile. Thanks!